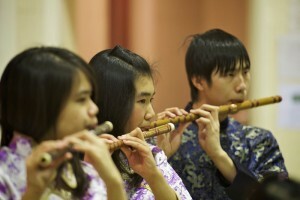 The Pagoda Chinese Youth Orchestra is based in Liverpool and is the first and largest Chinese Youth Orchestra in Europe. It teaches young people (up to 18 years of age) to play traditional Chinese musical instruments, including the Ku-cheng, or Chinese harp and offers a programme of training and performance opportunities throughout the year. The ensemble has played in several venues in and around Liverpool and has entertained tens of thousands of people with its varied and colourful Chinese melodies. The Musical Director is harpist Zi Lan Liao and during their visit to north west Wales, the instrumentalists will perform in various locations in Caernarfon. The Pagoda Chinese Youth Orchestra visit is part of the Two Dragons project in collaboration with Bangor University’s Confucius Centre which promotes Chinese culture and language amongst students and school pupils in the Gwynedd, Anglesey and Conwy regions. A brilliant performance from the Pagoda Arts Quintet.